BURGER KING® restaurants are bringing back the BK® fan-favorite snack, CHEESY TOTS™ to participating restaurants for a limited time only. BURGER KING® restaurants are bringing back the BK® fan-favorite snack, CHEESY TOTS™ to participating restaurants for a limited time only. The perfect snack or add-on to any meal, CHEESY TOTS™ are a bite-sized combination of warm potatoes and melty cheese inside with a crispy outside. CHEESY TOTS™ were brought back in November 2016 for a limited time only after fan demands on social media. 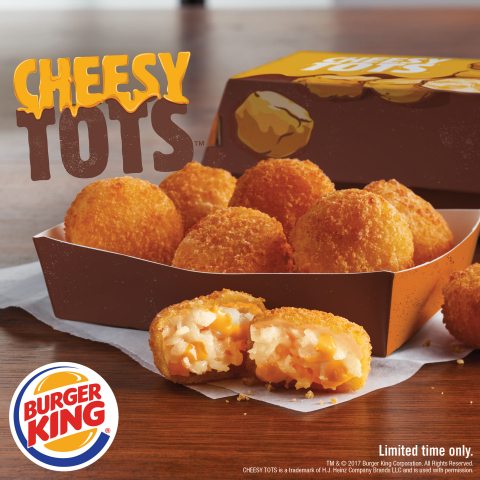 "We know our guests love CHEESY TOTS™, and we heard they want them for breakfast too," said Alex Macedo, President, North America, for the BURGER KING® brand. "These cheesy potato bites are the perfect addition to any meal, whether that be the WHOPPER® sandwich, new Crispy Chicken Sandwich, CROISSAN'WICH® meal or to just snack on its own." CHEESY TOTS™ are available for a limited time only at a recommended price of $1.99 for a snackable 8-piece order. About BURGER KING®Founded in 1954, the BURGER KING® brand is the second largest fast food hamburger chain in the world. The original HOME OF THE WHOPPER®, the BURGER KING® system operates more than 15,000 locations in approximately 100 countries and U.S. territories. Almost 100 percent of BURGER KING® restaurants are owned and operated by independent franchisees, many of them family-owned operations that have been in business for decades. The BURGER KING® brand is owned by Restaurant Brands International Inc. (TSX,NYSE:QSR), one of the world's largest quick service restaurant companies with more than $27 billion in system-wide sales and over 23,000 restaurants in more than 100 countries and U.S. territories. To learn more about the BURGER KING® brand, please visit the BURGER KING® brand website at www.bk.com or follow us on Facebook and Twitter.